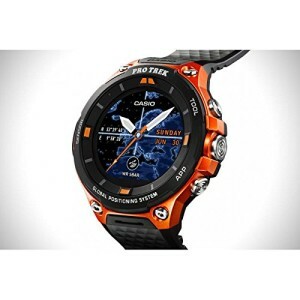 wsd-f20-rgbae Unisex Casio Pro Trek watch quartz power (rechargeable) Digital Display Features Multifunctional Waterproof 05 ATM water resistant case material steel Case Orange Dial color Black Strap Material Polycarbonate Strap Colour Black Smartwatch Casio with altimeter, barometer, compass, and GPS. Lets you control your smartphone from the wrist, as well as having an important series of own funzionalita ‘. Useable on both on iOS and Android. Useable even in water. Easy to set up and use. Charger included.